For some reason Google Maps and Verizon Navigation does not properly navigate to us. 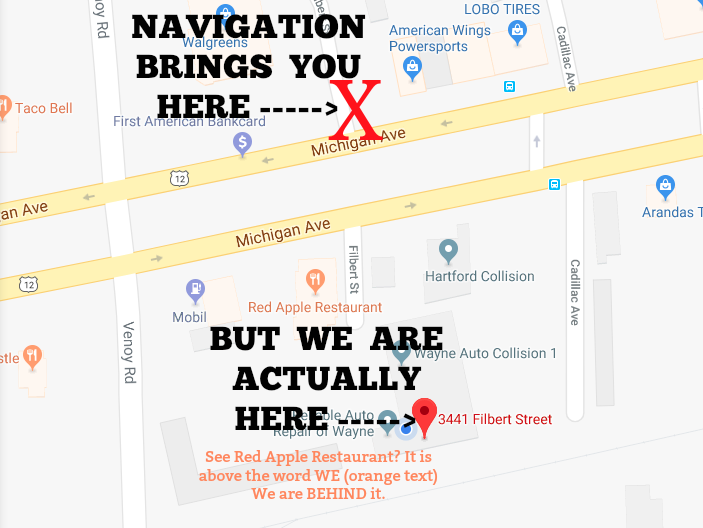 The address above will take you to Red Apple restaurant. We are located in the same plaza, directly behind the restaurant. You can literally park at the restaurant and walk 20 feet to our door, we are the corner unit. Tip: If you are hungry we highly recommend ordering the pizza at Red Apple. When you come in, please ring the door bell so we know you have arrived. Please have your drivers license ready. No merchandise can leave without identity verification. If you do not wish to show your license please have it shipped instead of picked up. 1. We do NOT have a "shopping area". Our pickup location is literally a room where you can pickup. If we have extra staff available they will be happy to carry your merchandise to your vehicle for you. 2. Orders MUST be placed online. We do NOT have cash on hand. We do not have a credit card machine. Additionally, our inventory and accounting is synced to internet orders data. 3. We have been asked numerous times "Can I look at it when I come to pick it up?" - of course you can! 4. We have also been asked "Can I look at it BEFORE I buy it?" - we record YouTube videos of every Lot so you can see exactly what you are buying before you buy it. Once the video has been recorded the items are double-counted, logged then packed for shipping and sealed (this is how we are able to ship such large orders so fast; the merch is already packed and ready to roll). With that being said, it is not logical for us to have anyone open the sealed orders to riffle through them, so the answer has to be "No", BUT you can refer to #3; you are welcome to look at the merchandise in our pickup area when you come to get it. 5. "When can I pickup?" - As soon as your order is cleared for pickup and an appointment is scheduled. Every order undergoes "Fraud Prevention Assessment". The software checks to make sure the order is legitimate and not placed using stolen card information. Once the order is deemed legit the order status is instantly changed to "Awaiting Shipment". If you are a repeat buyer the order typically clears within 30 minutes unless information on the new order is different from the previous order. If the software flags the order as "potential fraud" then the Order Status is changed to "Manual Verification". This means a Fraud Prevention Specialist has to physically review the order for legitimacy. Once your order has been cleared for shipment (or in your case, pickup) we will contact you via email to set up a time and day that is good for you. We can accommodate most days (and evenings too) except for Saturdays and Tuesdays. YOU MUST SCHEDULE AN APPOINTMENT TO PICKUP so we can make sure your merchandise is ready and someone is available to give it to you. If you pay via Pay Pal, Amazon Pay or Apple Pay, the order typically clears almost instantly unless you literally just made your Pay Pal, Amazon or Apple Pay. Equally, if you pay by eCheck, you will not be able to pickup until the payment has cleared (approximately 5 days). 6. Valid drivers license MUST be present to pickup. If you do not have a drivers license or do not wish to show it, simply have the items shipped to you instead of picking up. 7. And finally, we are asked "Can I come see your location before I buy?" 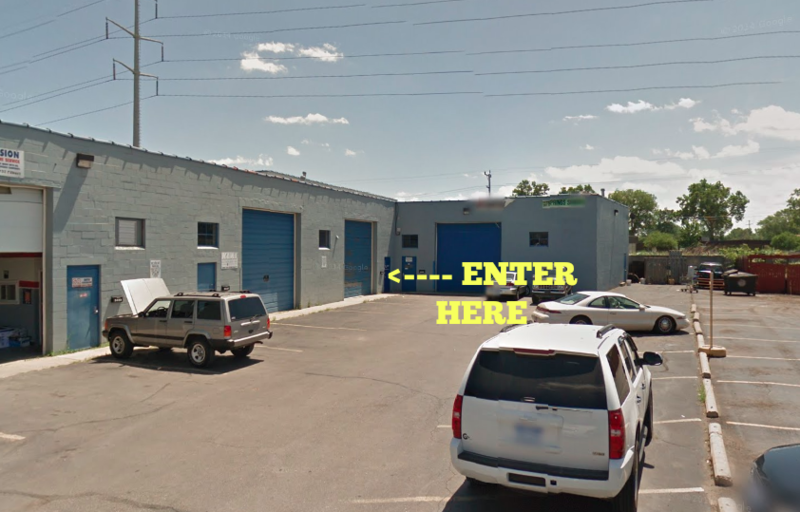 - If you want to come see our pickup location you are welcome to schedule an appointment, but as a reminder, we do not have anything to "shop" or "tour". A misconception is that our warehouse looks like a Sams Club or Costco. It does not, it is just a bunch of sealed packages; the packages stay sealed until they ship - this eliminates missing inventory and damaged inventory.